Are you stuck in a cake rut? Here's a beauty for you. 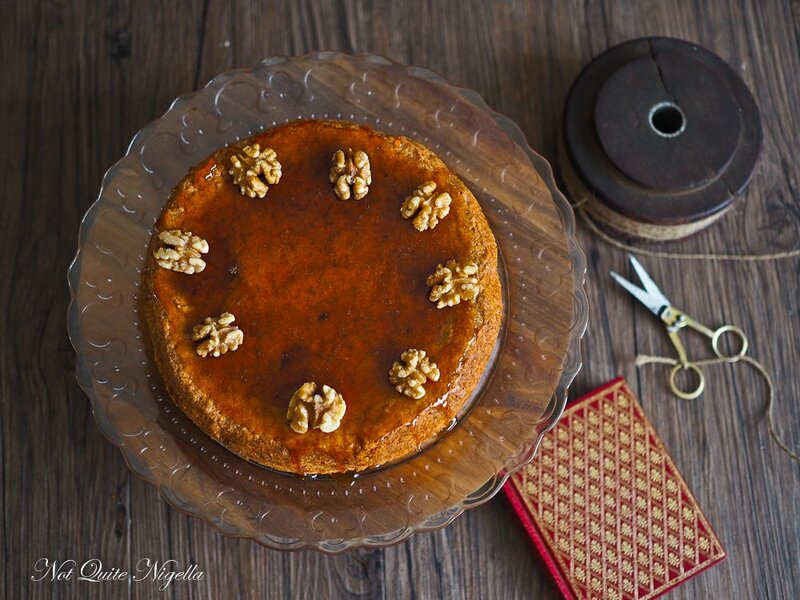 This French walnut cake or Gâteau aux Noix from the Perigord region is a super light cake that is low on effort but unique and gorgeous in taste. 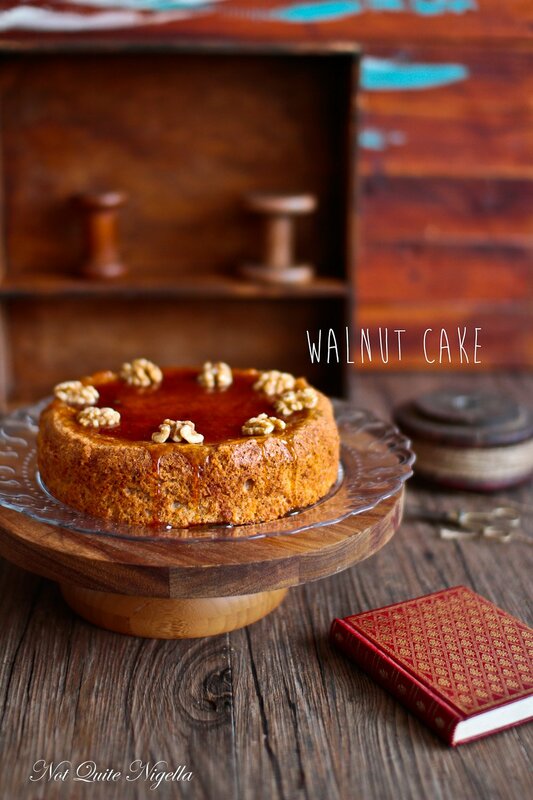 The goodness in this cake comes from the generous use of walnuts and the lightness comes from eggs. Crack the toffee on top and serve this in slices with cream. Let's call her Mathilde. 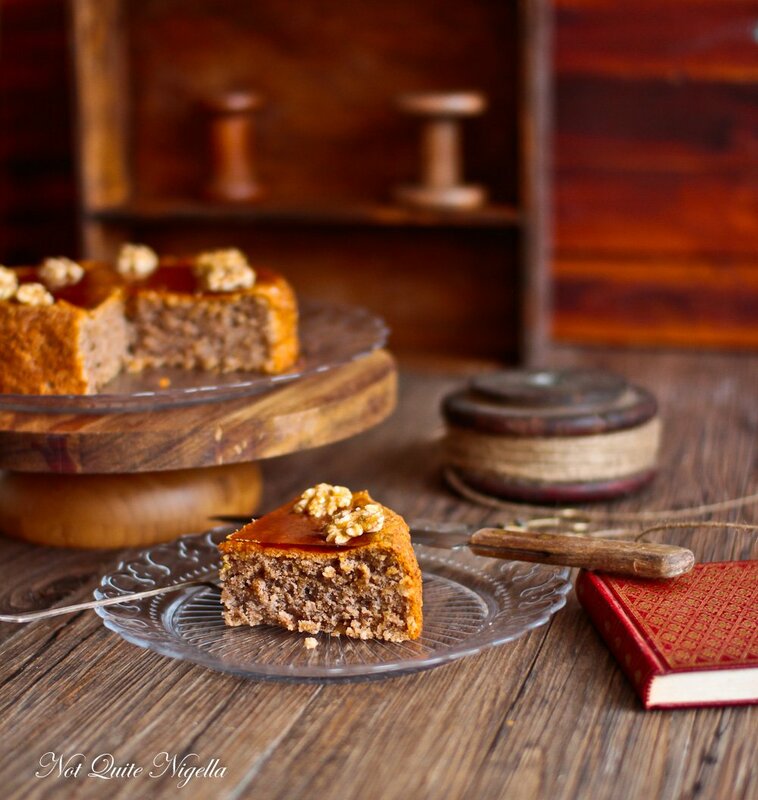 This recipe is from chef Gabriel Gate and I came across it on Cakelaw's blog. She belongs to a cake club and when she says that a cake is good, well I tend to listen to her on that. It's actually quite a simple cake. 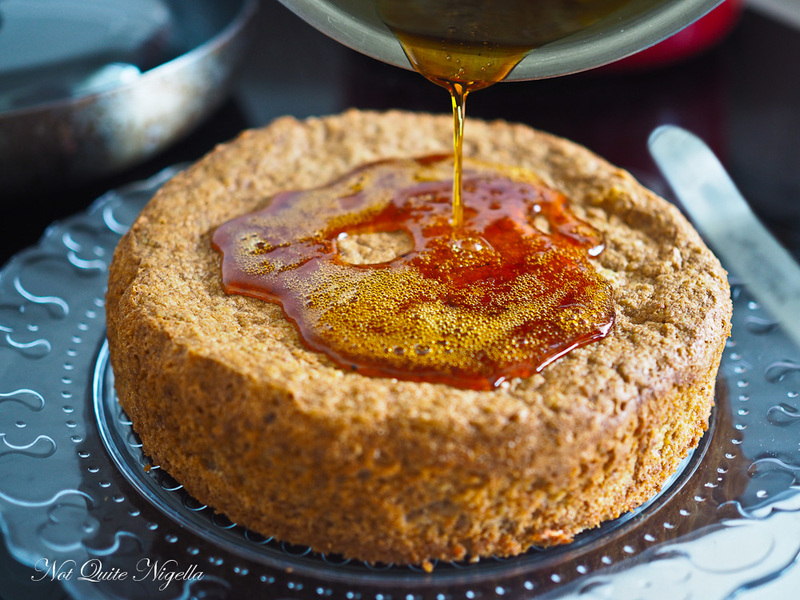 The toffee top is something that Gabriel added and usually people have a sprinkling of icing sugar on top so don't feel like you need to make the toffee if you don't want to. 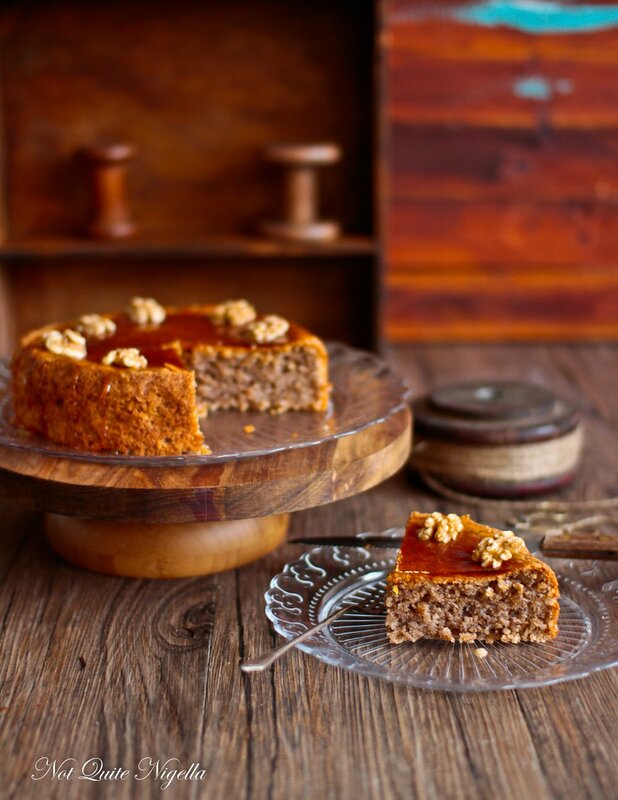 This walnut cake is one that improves with age so plan on eating it in two days' time (if you can stand it) and it will still be wonderfully moist (sorry). I did fiddle with it a little-I added spices that would enhance the walnuts. Nothing too overblown, just a smidge of cinnamon and cardamom that echoed the walnuts' earthiness. It smells fantastic while it is cooking and it's hard to resist especially when you walk past it and smell the walnuts and spices. Speaking of smells, we recently went out to dinner with friends Queen Viv and Miss America. The subject over dinner turned to Queen Viv's dating life. She hasn't had a great time of it lately as the men in her age group all tend to be conservative and while Queen Viv looks very proper, underneath the Helen Mirren exterior beats the heart of a rebel and a provocateur (much like fashion designer Vivienne Westwood whom she is nicknamed after). We suggested online dating because that way she could filter out the undesirable men so she wouldn't waste her time. She waved her arms and shook her head defiantly. "No I couldn't do that! I like to SMELL them first!!" she said passionately. I had no doubt about it, I mean you really have to trust your instincts on some people. You see her sense of smell may lead her in the wrong direction driving but sometimes you've just got to trust your senses to lead you in the right direction-of cake or whatever you may be looking for! So tell me Dear Reader, do you agree with Queen Viv about being able to smell a good egg? Would you make this with the toffee top or decorate it with icing sugar? And do you hate the word moist? Are there any words that you dislike or won't say? To toast walnuts, place on a single layer on a baking tray and bake in a 180C/350F oven for around 10 minutes. I usually roast them until they smell nutty. Step 1 - Preheat oven to 150C/300F and line a 20m/8inch round tin on the base and sides. 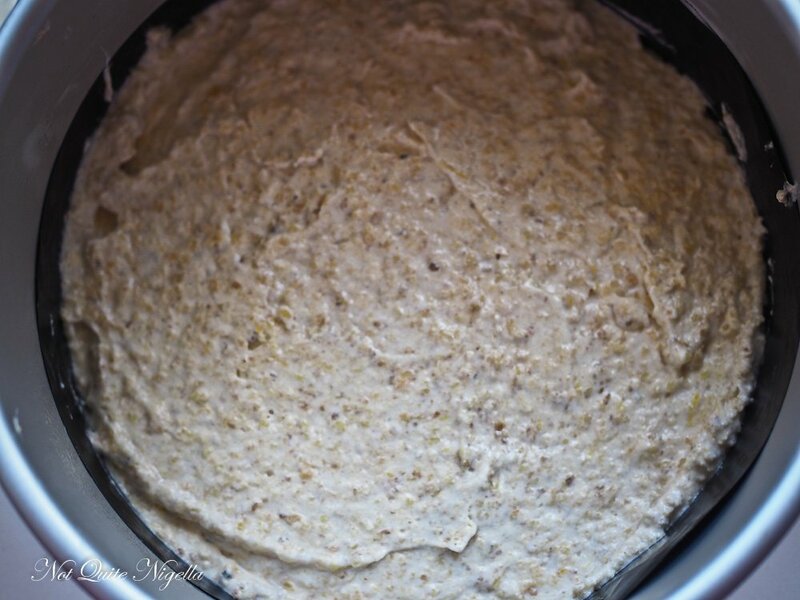 Grind the walnuts in a food processor until very fine in texture. Step 2 - In a mixer whisk the eggs whites and the cream of tartar. Once you get soft peaks add half of the sugar and whisk until you get stiff peaks. Remove from the bowl and place in another bowl until needed. Switch to a beater attachment and then beat the sugar, butter and lemon zest until pale and fluffy. Add in the egg yolks one at a time and then add in the cinnamon and cardamom and then the breadcrumbs and ground walnuts. Step 3 - Take a third of the egg white mix and fold it into the walnut mixture. Add it in two other lots folding it in gently but making sure that it is mixed in and that there are no big streaks of meringue. It should look a bit like porridge. Bake for 55 minutes or until a skewer inserted comes out clean. Cool in the tin for 5 minutes and then remove and cool on a wire rack. Step 4 - In a small heavy bottomed saucepan place the sugar and water and allow to dissolve the sugar crystals. Use a wet brush to brush down any stray sugar crystals on the side. Add the vinegar and once all the sugar has dissolved do not stir and allow to become a caramel. This is mainly a waiting game but don't leave it. Just turn the heat to medium high and watch it brown. 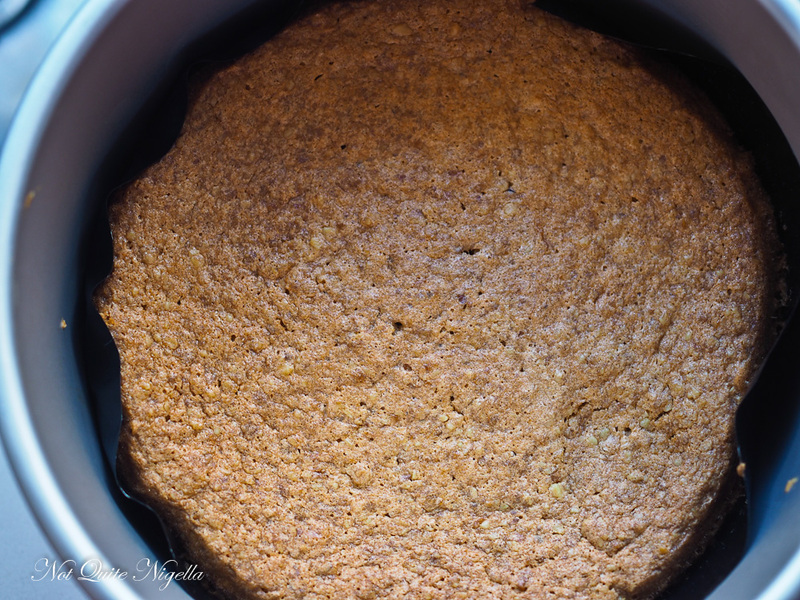 Remove it from the heat and then pour on top of the cake spreading it out with an angled spatula. Place the walnuts on top before it sets hard.